Do you ever have those times where you want to set up a vignette and you have all of the elements in your mind ready to go? Then, as you go to start pulling it all together, you come across something that total throws everything out the window, and you wind up with something entirely different? That is what happened with this vignette. 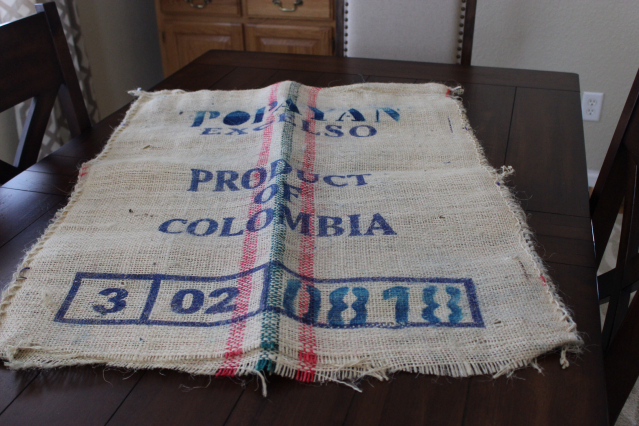 I had purchased this burlap coffee sack at a feed supply store several months ago. I paid $1.99 cash for it. Mr. B asked me when I bought it what I was going to do with it. I said "I don't know but, I've always wanted one and at $1.99 I am getting it" So, I did! I came across it again as I was looking for the right tablecloth for my fancy table and knew I had to set a Farm breakfast buffet instead. I then set this 3-tier galvanized tray set from Sam's in the center. I could see it filled full with croissants, hot biscuits, donuts and fresh fruit. A farm table has to have roosters, am I right? Luckily I had these salad plates in my collection. And the colors are perfect! Another rooster to keep the farm theme going. 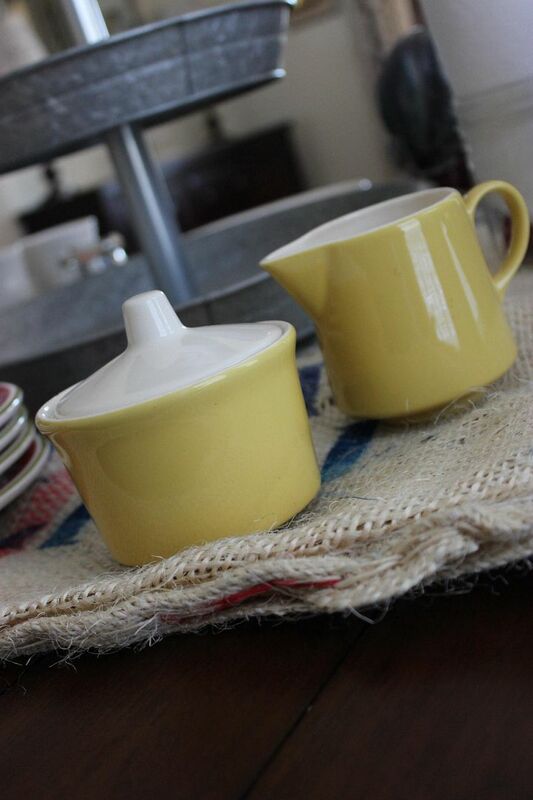 My favorite vintage sugar & creamer set. 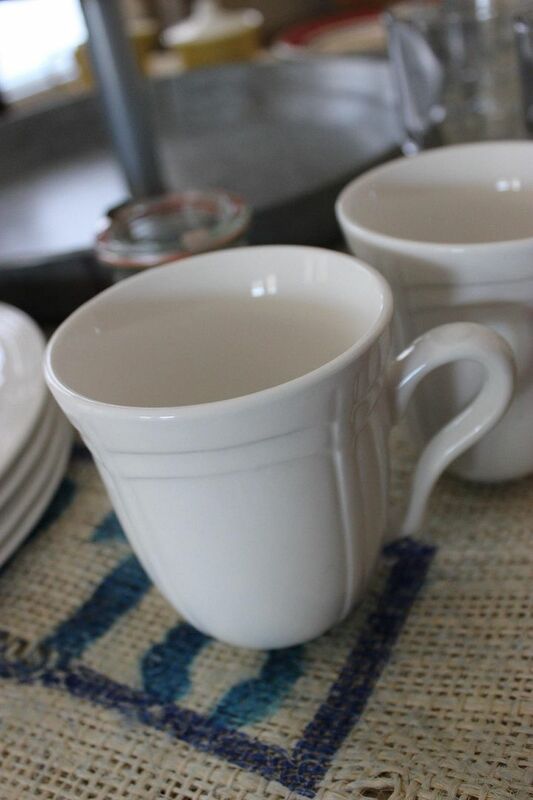 Gibson Everyday coffee mugs are part of a set along with the dinner plates. 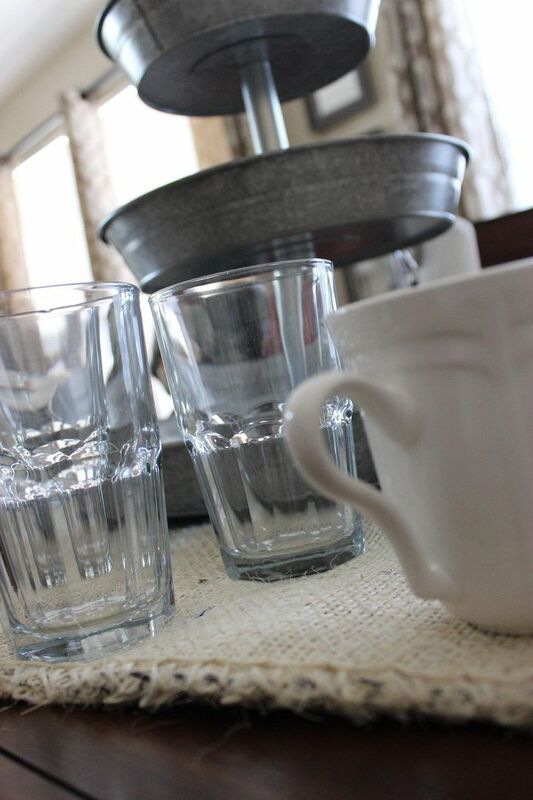 Plain and simple water glasses. 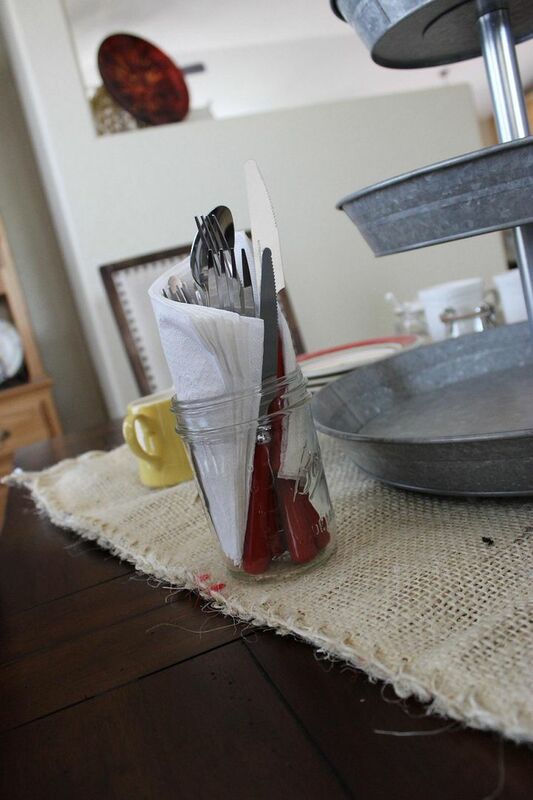 Red handled flatware and paper napkins in a ball canning jar. Small jars to be filled with homemade jams and jellies. Maybe I was hungry for some biscuits, gravy, bacon and hash browns? Maybe that is why I decided on this vignette. Maybe I will do that fancy tea party vignette next week. Or, maybe I will enjoy this one for a bit longer. Oh I love this. That burlap sack is perfect for this idea. 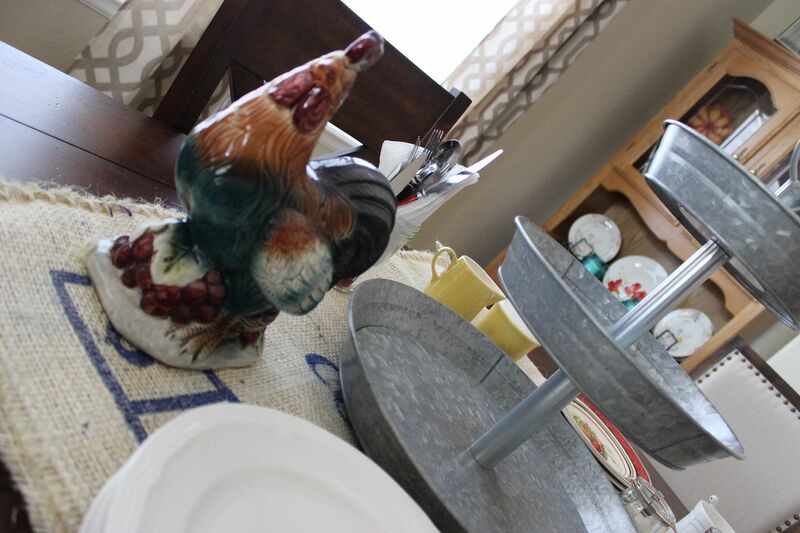 I have a huge collection of kitchen roosters...I'll have to find a burlap sack now! Love it! the rooster is so adorable and I wish I had one of those 3 tier trays! I'm on my way (well in a couple of weeks!!) and this is perfect for a good country breakfast! Love the 3 tiered stand! Are you a Rooster girl?? LOL! Kathe, I love what you put together here! First of all, I love the printed burlap underpinning!! 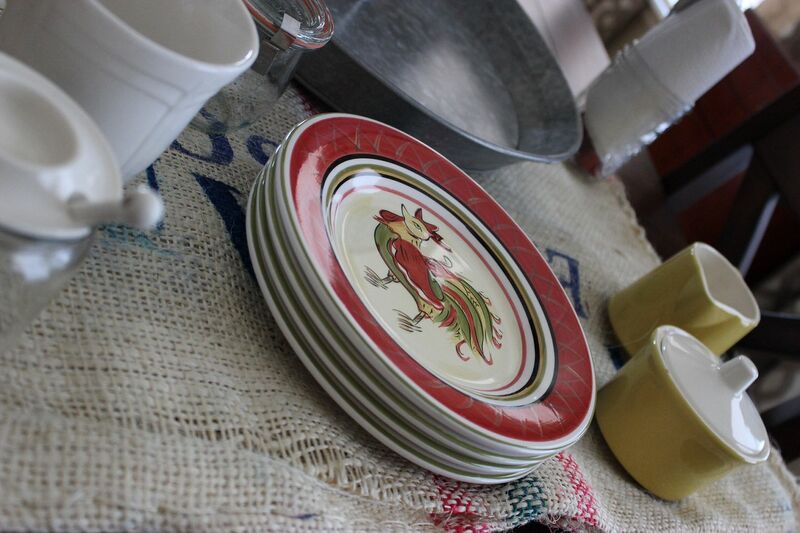 I also love the ball jars with flatware tucked inside and your rooster plates. I too am now longing for croissants!! Great post, Kathe!! I do that now and then. Start out with an idea in mind, find an inspiration piece and totally come up with something else. That coffee bean bag was a steal at $1.99 and what a great cloth! I'm ready for breakfast now, let me know when your serving!!! lol!! 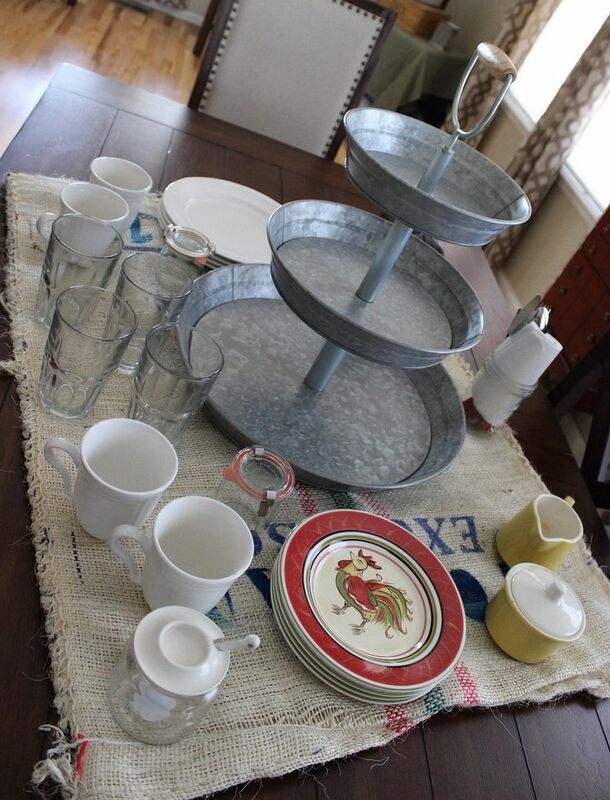 I love your table and the galvanized tiered tray is fabulous!! I can't believe you found it at Sam's!! Inspiration can come from the strangest places! I passed on the burlap bag at a Chicago store, but now I wished I hadn't. Cute post. You really did a 180 in your thinking on this one!!! I have done that on occasion, but this was one of the sharpest turns ever!!! I don't have a Sam's Club card, but I'd love to get one so that I can buy that galvanized tin tray set. It reminds me of one seen at Pottery Barn that was much pricier. The grain sack is terrific! It has been a long time since I saw one in person! We need to get out there combing the surrounding farmland for items like this!!! 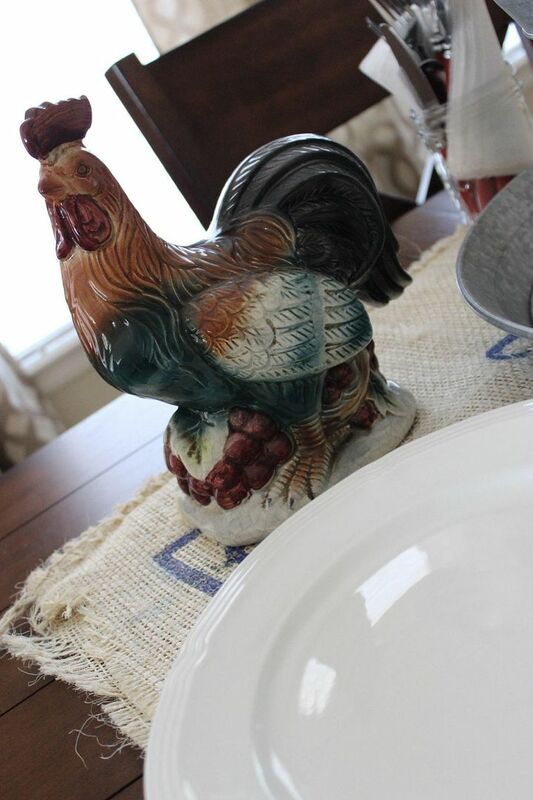 I am glad that you changed your mind and did this cute table...you know how much I like anything with roosters. I had to laugh at your comment about finding something to do with the burlap topper, sounds like something I would say to my husband when he asks why I am buying something he can't see any use for! I am going to check out Sam's to see if they have any of the 3 tiered trays left...I can think of lots of uses for it. Have a great weekend, Kathe! You had me at burlap and roosters! What a wonderful farmhouse table setting.The galvanized three tiered tray is perfect set on the burlap with just enough of the beautiful finish on your wood table showing. Looks great and the breakfast sounds wonderful. Being a country girl raised on hot home made biscuits every morning and going out to the smoke house and getting some fresh bacon, yum yum yum along with fresh eggs - now you have a good country breakfast to go with you lovely vignette. Everything works well together. I love the galvanized circular piece I will have to check out SAMs! I've never thought of myself as a farm girl, but, boy, I could go for that breakfast right now! 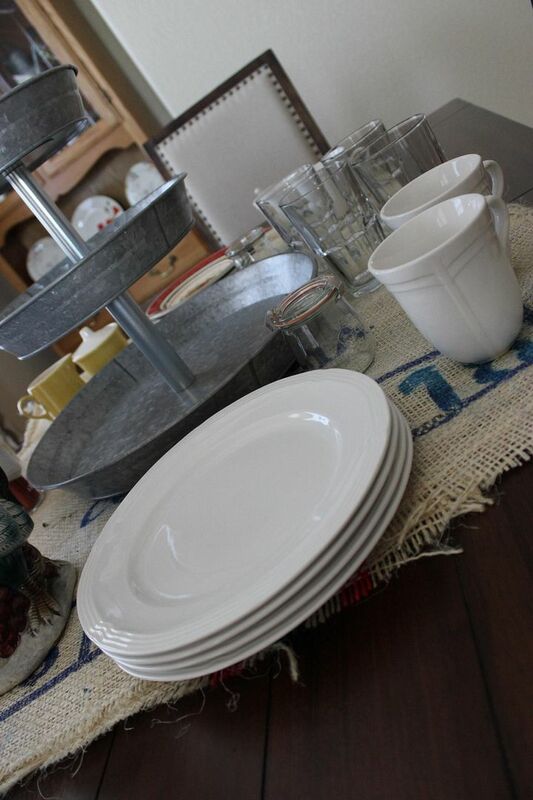 That galvanized 3-tier server was a terrific find at Sam's, the one at Pottery Barn was so much pricier! Your kitchen table is beautiful! 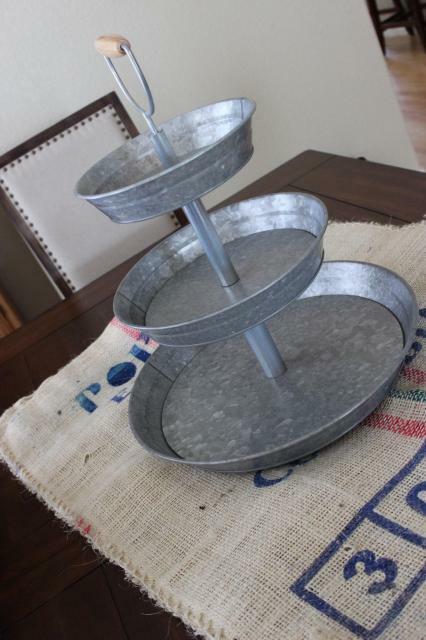 Cute idea Kathe, and I love that galvanized tiered stand, I wish I could find one of those for $1.99! Nice country look, Kathe! Love the rooster and that burlap. 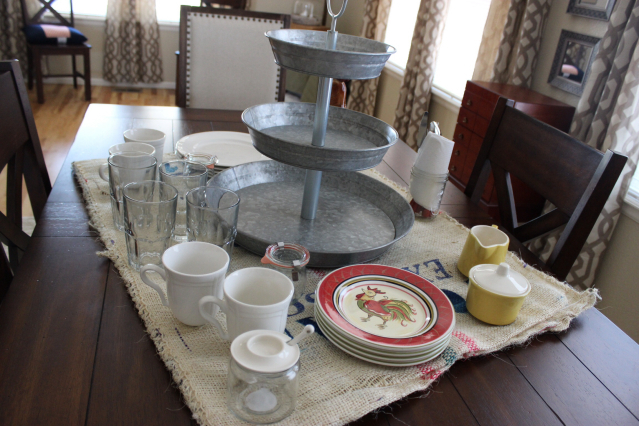 I've never seen a galvanized tiered tray before, but I sure like this look. The feed sack was a great choice. 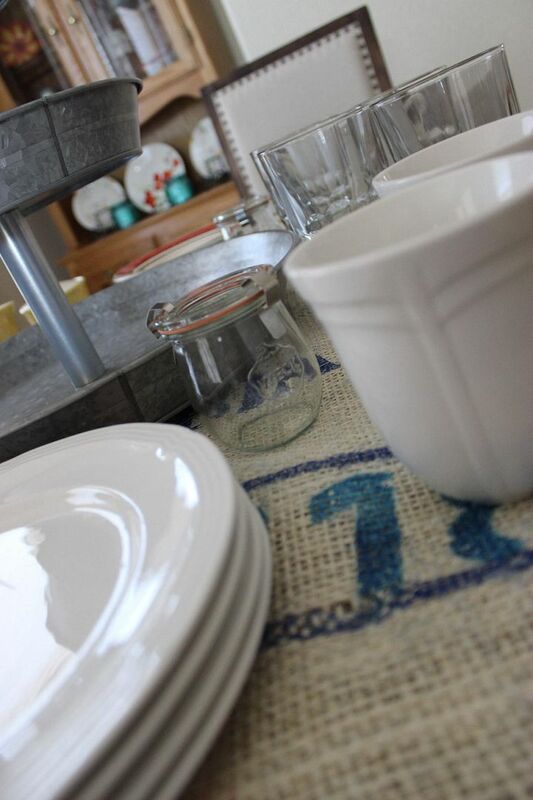 Love your tray stand and other rustic details. Kathe, how perfect. I all works. How Cute, My grandma had a roster like that! I would love for you to share your project on my Meet Up Monday Blog Party! So, when did you get the galvanized tray at Sams? I wonder if they still have some. I didn't see any when I was at my local one Saturday. VERY jealous. Lookss great, Kathe! Very inviting--would love to have breakfast at your home! Awe sweet rooster plates. Nice vignette. I love this! I can see it on a picnic table too out under shady trees on a sunny day. With the horses and cows grazing in the distance! 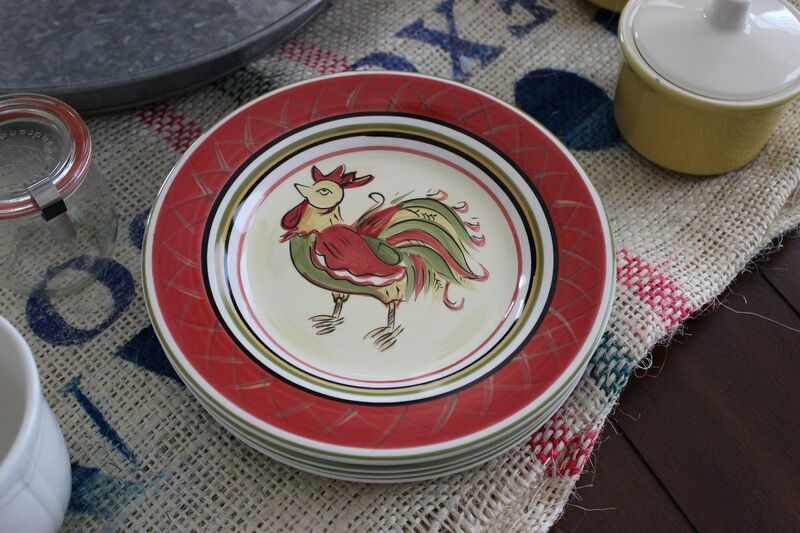 I love your rooster plates! They look like they're trying to be "fancy"!